There was a link to a story on the Bristol Rovers web site that was circulating around the Internet before the friendly international between the Philippines and Singapore at the Cebu Sports Center tonight that alleged that the country’s number one goalkeeper Neil Etheridge has opted to stay with his club rather than play in the Suzuki Cup later this month. Because Roland Müller has yet to confirm his participation as well, the obvious question was – therefore – who will keep goal in Bangkok. Thus, if there was a time for the Philippine Army’s Eduard Sacapaño to remind the doubting Thomases that he does – indeed – play in that position, that time was tonight in Cebu. 96 minutes later – although the referee indicated just four minutes of added time – who among the thousands packed inside the stadium – as well as those glued to their television sets – even spared a thought for the names Etheridge and Müller? Just another day in the office for the Army veteran, who must have wondered often what he needed to do to win the doubters over. Life, they do say, is all about moments. Tonight, Sacapaño seized his with both gloves! There is no arguing that the two will remain, when available, ahead in the pecking order. But my word, the night belonged to Sacapaño! A dour first half came to life in first half added time when Khairul Amri won a dubious penalty after a clash with Jeffrey Christiaens inside the box. It was actually Amri who backed into the leftback to initiate contact. 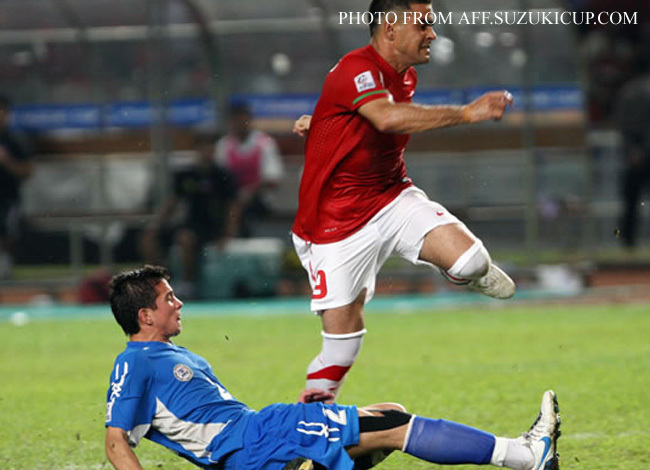 Shi Jiayi struck his penalty low and hard; but Sacapaño dove to his right to push the ball away. The Cebuano crowd went delirious at seeing justice served by the Filipino goalkeeper where the referee could offer none. Twice in the second half, Sacapaño was again in fine form in keeping out two Singaporean freekicks that looked destined to hit the back of the net. The first, in the 72nd minute, was from a soft foul called on Juani Guirado after Singapore’s veteran Aleksander Duric fell at the lightest of contacts. Sacapaño managed to stick a glove out to prevent the ball from entering the goal; and from the rebound, Shi Jiayi’s shot at close range came back from off the post. The Philippines were happy to clear. The second save, from a naïve foul committed by Joshua Beloya in the 87th minute, was even better. The ball was curling into the lower left-hand corner of Sacapaño’s goal, but the goalkeeper covered the gap like an arrow springing from a bow and pushed the ball away to safety. By this time, the Philippines were a goal ahead. The match came to life in the second half after the introduction of the Younghusband brothers, who were kept on the bench in the first half ostensibly because of their participation in the UFL Cup semi-finals last Tuesday. Phil, so often the Philippines’ goalscoring hero, was tonight quite content to be the provider. After neat interplay between him and his brother James down the right flank, Phil sent in a deep cross in the 53rd minute that was met at the far post by Patrick Reichelt. Reichelt played the ball first time back to the centre where Marwin Angeles – of all people – had a foot stuck out to nudge the ball into the net for his first international goal. Dennis Wolf could have made the scoreline even more emphatic for the Philippines with two headers in the second half. 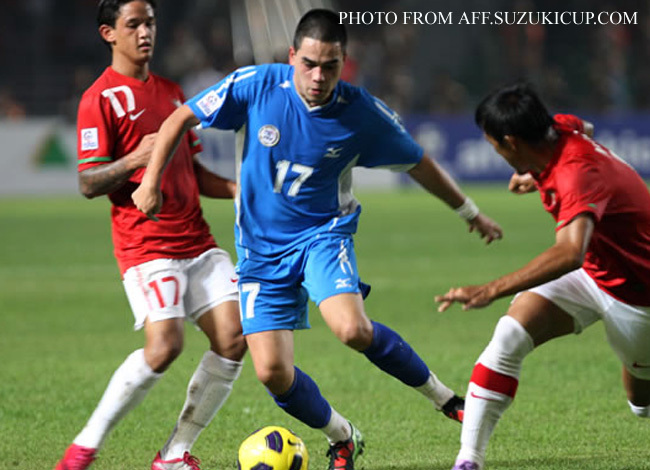 The first was in the 78th minute when he dove to meet a glorious cross from the right by James Younghusband. The header was palmed over the bar by the Singaporean goalkeeper. Three minutes later, his header from Phil Younghusband’s cross after the Philippines broke quickly down the right flank nicked the bar. His body form was all wrong to begin with; and his header lacked the power that the cross deserved. Singapore finally had the ball in the net deep into second half added time; but this was preceded by an obvious foul on Sacapaño. When the referee blew to signify a freekick for the Philippines, he crucially got this one right. While the Singaporeans dominated possession early in the match, they never really looked like coming up with an end product. Their shot statistics were flattering; but ultimately deceiving. In short, they looked like – well – Singapore. Most of their shots were from distance; and when they did come within a sniff of the Philippine goal, they lacked the quality to finish. At the opposite end, their defenders were resorting to nervous fouls high up in midfield; as sure a sign that there could possibly be that they were wary of the Philippines’ attacking players getting any closer to their goal. While the Philippines kept their shape in the first half and defended well – particularly as Singapore were knocking the ball about crisply – their attack lacked fluency and the makeshift midfield partnership of Jason de Jong and Chris Greatwich looked every bit like a couple not on speaking terms. In the second half, the Philippines were a totally different team, finding spaces that were not there in the first half, linking together passes and creating chances from open play – in contrast to the first half when if a goal came at all, its most likely source was a dead ball situation. With the stirring and confidence-boosting 1-nil victory completed before a noisy and delirious Cebuano crowd, the Philippines thus swept its home-and-away friendlies this year against Singapore. 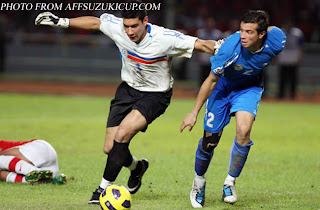 The team had earlier defeated the visitors, 2-nil, in a match played last September in Singapore. The most lasting memory of the match will probably be the sight of Sacapaño getting up after pushing a Singapore freekick around the post to quietly dust himself and his gloves, totally oblivious to the fact that he had just made an incredible save.